On the weekend I had the great pleasure of shooting with the talented photographer Lauren Horwood, makeup artist Rachel Montgomery (who also did my cover of The Fictional Woman) and hairstylist Paula Hibbard. In keeping with the traditions of the vintage and retro scene I enjoy, we did some feminine pin up styles on our first Victory Lamour shoot together. This time I wanted to keep it retro, but to go for something a little different. It’s an idea I’ve been wanting to shoot for some time. 1) Above: Paula begins the hair while Rachel smoothes out some base. 2) Below: Rachel Montgomery applies shadow lines to my natural frown lines and crow’s feet. These days, deep lines on a woman’s face are treated as almost (but perhaps not quite) as scandalous as facial hair. Photos by Lauren Horwood. I was called ‘tomboy’ as a kid, in part because I hated dresses, and though I have since come to love them I still enjoy a good mix of traditionally male and female garments, as many women and girls do. I’ve been interested in the performance of gender – through clothing, speech patterns, behaviour, etc – for some time, and this topic is one thread among my areas of study at the Department of Gender and Cultural Studies at the University of Sydney. (Judith Butler coined the term ‘gender performativity’ in Gender Trouble, 1990.) Ideas of appropriate dress, including gendered dressing, have changed over time, of course. I touch on this in The Fictional Woman. In Victorian days boys were clothed in pink, and girls in blue, rather than the other way around. As Rudofsky and others point out, men throughout history in various cultures have often worn skirts and are in some ways more physically suited to the style. Various laws have governed gendered dressing, including laws that banned women from wearing pants. For example, in 1799 the police chief of Paris decreed that any woman wishing to wear pants must seek special permission from the police. Later, it became lawful for women to wear pants only if they were cycling or riding a horse. Technically, this law was only overturned in Paris in 2013. Only this year women attendees were turned away at Cannes for not wearing high heels. Anyway, in keeping with midcentury notions of identity and style, the contemporary vintage and retro scene is most often associated with that gendered tradition we think of as ‘classic’ – garters, heels and dresses for women, pants, collared shirts and short hair or pompadours for men. Now that I was being photographed in classic midcentury/retro feminine style as Victory Lamour, naturally, I also wanted to swap. 3) Below: The pompadour gets finishing touches from Paula Hibbard. Photo by Lauren Horwood. For our shoot, we would start out ‘tomboyish’. Bowie-esque, perhaps even a bit Teddy Boy. (David Bowie has been one of the most convincing proponents of androgyny along with his sometime muse/twin, Tilda Swinton. Oh and who could forget Grace Jones’ spectacular A One Man Show?) For this my eyebrows were thickened a little, but otherwise there was no transformative makeup. Paula created an incredible pompadour by braiding and tucking up masses of my hair, and curling the front around in the classic shape. We would shoot that more natural style and then we move into what I called ‘the full dude’. Rachel bought a moustache for him. I wanted to see how much it would take to look not just masculine, but like a man. My vintage persona is Victory Lamour, so why not a Victor Lamour as well? Unsurprisingly, the first stage was the most comfortable. It felt like a projection of some aspect of my genuine self. I own the pants, the tees. I often go without makeup, though not on TV. Many argue that we all have ‘masculine’ and ‘feminine attributes’, and I could project those so-called masculine parts of myself with ease. I took up more space, relaxed my posture, frowned, and basically got my swagger on, as you can see in the photo at the top of this page. (Have you ever noticed how often magazines reinforce the idea that women are to pout but never frown, while most mags from GQ to Men’s Health present an ideal of masculinity that involves frowning aggressively at the reader?) In short, the tomboy felt quite natural and a whole lot more interesting than being photographed in most women’s wear outfits. This nod to masculine vestimentary tradition, while still looking identifiably female, is an acceptable form of play for women and girls because the ‘correct’ gender can be picked, and the nod is towards the more dominant gender. Broadly speaking, boys being perceived as ‘girly’ is considered more shameful than boyishness is for girls. (With exceptions.) It’s telling that lazy insults relating to gender identity and sexuality (‘dyke’, ‘trannie’, etc) are still go-to favourites for bullies. Without makeup, adornment or feminine poses, one can push masculine clothing outside of the mainstream tomboy form. I gave it a good nudge (above). Gender is bent, perhaps, but not snapped. So we went the full dude. For this we would need contouring, shading and a good mo. 4) Above: Rachel shades my jaw. 5&6) Below: ‘I am the walrus…coo coo kachoo.’ Trimming the mo and discussing the shots. Photos by Lauren Horwood. 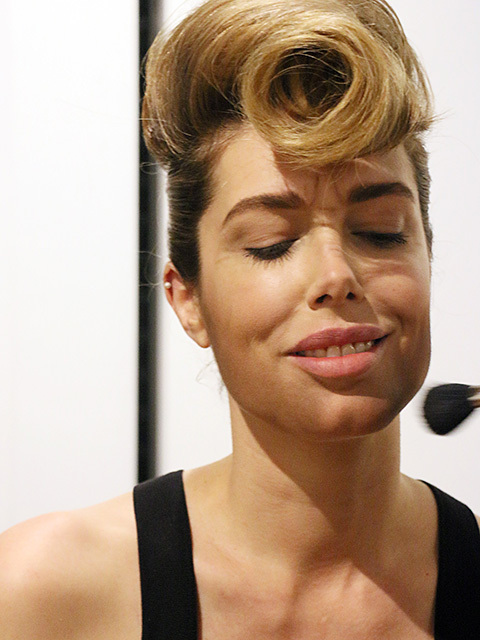 One group of women who regularly do this, and without professional assistance, are Drag Kings. Interestingly, D.R.A.G. is derived from ‘dressed as a girl’ with the term D.R.A.B. being ‘dressed as a boy’, however, in time the term drag came to apply to both male and female cross-dressing. The Drag King tradition has been around long before Cindy Crawford got in drag to pose for Herb Ritts, or Kristin Scott Thomas for Max Farago, but they still don’t get as much recognition as Drag Queens. Transgender activist Calpernia Addams speculates that this may be in part because there is less of a shock factor involved in a woman putting on a suit, but she also says that ‘women continue to face a lot more discrimination…and Drag Kings are something that have come out of the culture of women.’ Drag Kings in this great clip, showing the makeup transformation process, agree. The magnificent Murray Hill recently performed at Sydney’s Opera House and brought that house down. There is definitely room for a whole lot more of this style of performance. I had a blast playing Victor for an afternoon. I look forward to seeing the rest of the results of our shoot, and maybe seeing a little more of him. Though, whoever says it takes women longer to do their hair must be dreamin’. 7) Above: Photographer Lauren Horwood gives our man the kiss of approval. * All photographs copyright of Lauren Horwood. WOW! Love this Tara, thanks for sharing. Tara, I love your confidence to play and to share that playfulness. Victor is a great looking fella, I hope the rest of the shots capture him as you see him. Ha, I love the transformation, always curious as to what this could be! I myself do something like this! I love to transform, to experiment, this can sometimes give unexpected answers to old questions.